We Have That… But Will We Always? “Demolition is under way on the southeast corner of Alaska Avenue, California Avenue SW, and 42nd Avenue SW, on properties that were once anchor points of the West Seattle Junction. While the buildings have been empty for more than a year and life has continued as normal, many of us have taken comfort in knowing interesting restaurants and shops will return to the corner someday. But what if they didn’t return? Two-dozen other boutiques still line The Junction. For some West Seattleites, these stores are rich with treasures: Home décor to fashion, shoes, eyewear, music, wine, and beer, pet supplies and more. Store regulars know the shop owners and clerks by name and enjoy the personalized service only stores like these can provide. For a greater percentage of area residents, West Seattle shop windows are just eye candy, gazed upon as we stroll the avenue and duck into our favorite restaurants. Window shopping is a difficult task to monetize, so the futures of many of these stores might be passing them by as well. 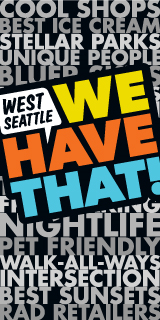 Do you “Buy Local” in West Seattle – not just The Junction, but other areas as well? Please share your story in the comments section below, including: If you prefer to shop at malls or online, would you miss West Seattle’s locally owned stores if they went away? The discussion isn’t merely about supporting a few dozen retailers. It’s about preserving the way of life that sets West Seattle apart from other corners of King County. To spark retail support from Alki to Endolyne and beyond, the West Seattle Junction Association launched “West Seattle: We Have That” in partnership with a coalition of local retailers and the West Seattle Chamber of Commerce. Keith Creighton is a West Seattle-based writer.